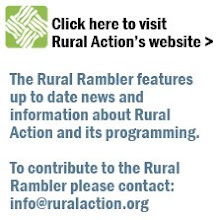 The Rural Rambler: Third Annual Adventure Auction! DeAloia, as well as a cash bar featuring wine and Jackie O’s microbrew. There are some great packages up for auction for all types of people and all sizes of wallets, including: a five-course seafood dinner with wine pairing for six, a one-week stay in a cottage in South Carolina, massage and wellness packages, paintball, zipline passes, local food products and much more! For more information and to purchase tickets, please visit: www.adventureauction.org. Buy a ticket for yourself, or buy a pair and receive a price break. Or, rally up your friends and purchase a table of eight. Current Rural Action members and Giving Society members can purchase tickets at a discounted rate. If you have questions or would like to purchase tickets over the phone, call: 740-767-4938. The Adventure Auction is only 2 ½ weeks away, so buy your tickets today!